I first noticed that readers took pride in the newspaper profiles I had written about them when I walked into the lobby of the Trudeau Institute in 1994. I was a correspondent for the Plattsburgh Press-Republican at the time. They framed my full-page profile of the Institute and founder Francis B. Trudeau Jr. and hung it on the wall. During my stints as a writer and editor for several newspapers in northern New York over the past 20 years, I've enjoyed writing profiles of dozens of people and businesses in the region. And readers continue to frame my stories. Several years ago, I was faced with getting Christmas gifts for my two brothers-in-law. I wasn't sure what to get them, so I made my own. I interviewed their children about the relationships they had with their fathers. I laid the profiles out newspaper style, with photos, and framed the stories as Christmas gifts. It was personal, memorable and heartfelt -- a one-of-a-kind gift that can't be returned or replaced. 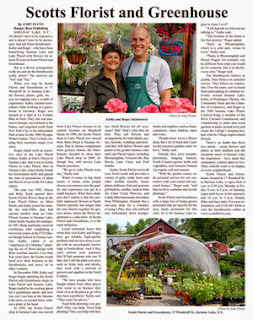 I also framed a profile I had written about Scotts Florist and Greenhouse in Saranac Lake and gave it to the owners as a gift. They have it hanging above the cash register for people to read while they wait in line. WRITER FOR HIRE: Now -- from my writer's studio in Saranac Lake -- you have the opportunity to hire me as your personal writer. I'll write your profile, lay it out newspaper style and frame it. Or hire me to write a profile as a gift for someone else. I'd love to paint your picture with words in portraits I call "Your Story" profiles. For links to some of my profiles and to learn more, visit the Your Story page.